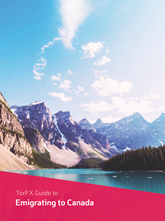 Canada has lots to recommend it as an emigration destination, from its unique blend of French and Native American cultures to its varied landscapes and welcoming populace. If you’ve got emigrating to Canada in your sights, getting to grips with your international money transfer options long before you move can have a really positive impact on your pocket. All currencies are volatile and the Canadian Dollar is no exception. The currency market is always moving and a favourable rate can become decidedly unfavourable within a matter of hours. If you want to avoid missing out on a positive market movement or protect your transfer from currency risk, TorFX can help. Our in-depth regular market updates help you keep track of how the Canadian Dollar’s performing and your personal Account Manager can target a rate on your behalf, eliminating all the hassle. With their support you can achieve a competitive Canadian Dollar exchange rate and also benefit from avoiding transfer fees and commission costs. And once you’ve moved to Canada TorFX can continue helping you save money while removing the stress of managing regular transfers.